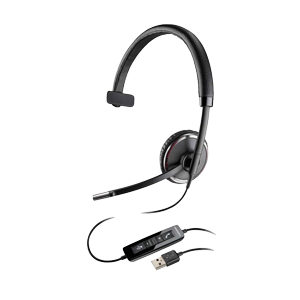 Business Communication Headsets - Headsets Direct, Inc.
Understanding the difference between Business and Consumer Grade Headsets. I often hear customers’ frustration with their headsets, but what they don’t realize is they simply invested in the wrong solution. If you’re not experienced with headsets, you typically stop off at your local office supply store and head to the telephone isle where there will be a few choices of headsets on display. Users won’t understand until later that these headsets are very basic in selected wearing styles and also low in quality. They’re okay if you’re talking to friends and family, because they’re just happy to talk to you…your friends don’t care about how well your headset sounds. The low-quality headsets might also be fine if you rarely spend more than a few minutes on a phone call, as they can be quite uncomfortable on a long call, especially if you can’t get up and move around. But trying to use these headsets in the business world is a very different story. When you buy headsets at your retail store, you’re investing in a very basic low-end, low-quality, not-very-comfortable solution…but it does give you hands-free communication. More often than not, a cheap headset is more frustrating to use than the value you get out of it, and you soon find you have stored the headset away in your desk drawer, never to be used again. So the money you did spend on that headset is often wasted. If you were to spend a little bit more on your headset investment and purchase a business-grade headset, you would quickly realize you will never want to talk on the phone without it again. 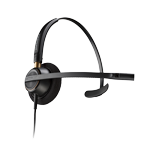 Some of the main differences between home-office headsets and business communications headsets are; the many choices from which you have to choose, how the headset and amplifier connect, the great sound quality, and the overall quality of the product. When looking at choices for home-office headsets you will generally find one headset in a box with an amplifier, and you’re hoping that it’s compatible with your phone. When you compare that to business grade headsets, you will have an amplifier that has multiple choices for compatibility, setting options so it will work with a much broader range of phones, and many choices of wearing styles for the headset. Some of the various wearing style options in business grade headsets include; an over-the-head style with a single-ear option, an over-the-head style with a dual-ear option, over-the-ear style, and convertible headsets which include both over-the-ear and over-the-head options. Users will find that they have different advantages with different wearing styles. For example, an over-the-ear model works well if you don’t want to mess up your hair, and you interact with customers face-to-face. An over-the-head headset will fit more securely, and if you have a headband over the head with both ears covered, you can focus on your caller and not be distracted with background noise around you. The dual-ear style is particularly good in loud environments or busy, noisy work places. Convertible headsets work well for users that have never used a headset before and are unsure of what wearing style they would prefer. They can try both styles and see what works best for them. Convertible headsets also work well if you have multiple people using the same headset, giving each user the flexibility to choose which choice is the most comfortable for them. When you purchase a home office headset, the headset and amplifier plug together by a modular plug at the end of the headset, and that plugs into the amplifier. Unfortunately there is not an easy connection to pull the two apart without eventually breaking the modular clip, which is a great liability with low-end headsets. So every time you need to walk away from your desk to make copies, get reference material, or just to refill your drink, you have to take the headset off, and when you come back to your desk, you will have to put the headset on and re-position it. On the other hand, business grade headsets are joined together by what is called a quick disconnect. It’s a special connection that allows the user to leave their desk by unplugging the headset from the amplifier, and they can leave the headset on. Having a quick-disconnect connection is a great convenience for daily use, and it allows you to choose from many different wearing styles of headsets. Another great convenience is the option for some business communication headset users to be able to answer phone calls and talk on the phone while walking around their office, getting their chores done, or retrieving information for the phone call. No more rushing back to your desk to answer your phone or end a call when all you have to do is push a button on your headset. Many home office headsets will have a definite tinny or squeaky sound, which is in a higher frequency range than what we normally hear, lacking a crisp, clear sound. When you move up to business grade headsets, you will have quality that is equal to, if not significantly better, than what your handset provides you. Business grade headsets provide a full, very wide frequency range quality that’s easy on your ears for all-day wearing enjoyment; you will never get tired of listening. As an investment, if you compare home office headsets at $50 and high-quality business grade headsets at $100-$150, even though you’re spending 2-3 times the money on business communication headsets, you’ll find you get much more value for the business grade headset, because the quality is so much better, the fit is more comfortable, and again, once you have a good headset, you will never want to be without it. You’ll find yourself using and enjoying that $100-150 investment, which will give you a great value and good ROI on your investment. In contrast, you can spend $50 on a consumer-grade headset, be very frustrated with it, and find it sitting in your desk drawer not being used. It’s worth considering your budget and expectations before buying a headset. Is it worth putting $50 into a device you may not use, versus delaying your purchase until your budget allows purchasing a good business grade headset that you will use and enjoy? If you upgrade to a business grade headset, you will come to enjoy the luxury and productivity boost of hands-free communication.